We want you to take control of your future. 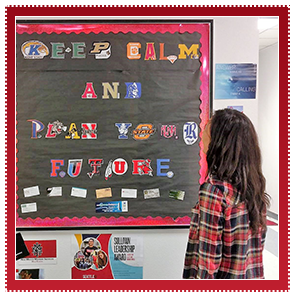 We encourage you to take advantage of the services our guidance office has to offer such as financial aid workshops and career choice counseling as well as college and military presentations. The State of New Mexico requires every high school student to have a Next-Step Plan on file. The Next-Step Plan provides a framework for your academic decisions as you go through each of the high school years in preparation for college, the world of work, the armed services, or other endeavors. Towards the end the of your 8th grade year, planning takes place in a meeting with you, your parent(s), and a member of the guidance department. After an agreement is reached for your courses for the coming year, the Next-Step Plan is signed by you, your parent(s), and the guidance counselor. We understand that plans may change as you learn of new opportunities and approach the time of your graduation. You’ll have the chance to update and change your plan to align with your current interests and goals when you review and update the plan every year. To ensure that you stay on the path to success, you must complete and/or update your Next-Step Plan prior to receiving a class schedule or making any schedule changes. Your success is in everybody’s best interest. We are here to help you on your journey to achieve your dreams. Please schedule an appointment with a guidance counselor if you have any questions or concerns. Know yourself. Your abilities, interests, and ambitions are important when goal setting. Initiative and personality determine your success. Plan for the world of work. Explore occupation fields—even before you enter high school. Plan for your vocation as early as possible. Look for opportunities to gain experience, and talk to people who work in the occupations that interest you. Select your college or vocational school. Investigate the schools that offer training in your field. Plan your high school program. Check college and university websites to ensure you get the classes you need. Learn to study. Constantly work to learn and improve study habits. Strive for good grades. If you have below a “B” average, talk to your teacher about how to overcome your challenges. Become a well-rounded individual. Develop hobbies, participate in your community, and network with people. Plan your finances. Know what to expect and prepare financially. Seek out financial aid and scholarships. Learn about college acceptance. Know what admissions exams are required. Prepare for scholarship and application early. Get scholarship application information by December 1 of the year before you expect to start college. We have included course descriptions and graduation requirements in the parent-student handbook below. Practice and preparation make all the difference. Get a head start, and know what to expect for your college admissions testing. Deciding where to go and how to pay for college can feel overwhelming. However, with careful planning and hard work, you can achieve your goals.